As the dancers of San Francisco Ballet prepare to perform 12 (12!) world-premiere works in four programs beginning April 20, Artistic Director Helgi Tomasson has brought in the National Ballet of Canada to perform John Neumeier’s intense and ambitious “Nijinsky.” It’s a splendid gift to local ballet and theater audiences, because the large cast, sets, and costumes have been transported from Toronto for just a week. If it were a play, “Nijinsky” might well be extended. John Neumeier, who leads the Hamburg Ballet, choreographed this piece for his company in 2000, and we saw them perform it here five years ago. It’s a thrilling evening of terrific dancing, to music by Chopin, Schumann, Rimsky-Korsakov, and Shostakovich; but it won’t be to everyone’s taste because you need to either read the short program or know about Nijinsky’s life and work with Serge Diaghilev’s Ballets Russes to follow what’s going on. 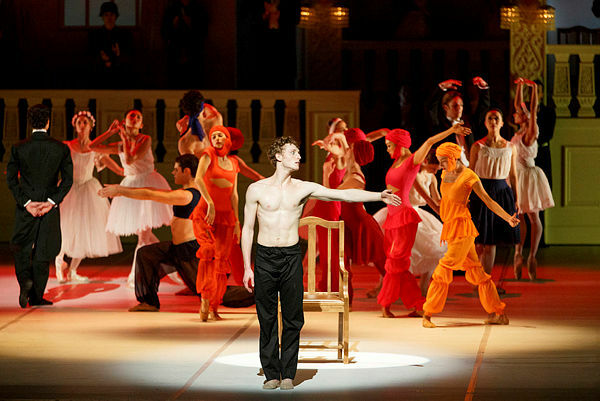 After Nijinsky imagines seeing Diaghilev, his former mentor and lover, on a hotel landing, he relives fragments of his famous roles. Danced by others, these include Harlequin, Spirit of the Rose, the Golden Slave in Scheherazade, the Young Man in Jeux, the faun in L’Après-midi d’un faune, and Petruschka. Intermingled are people from his own life: his sister, Bronislava; his older brother, Stanislav; his mother, also a dancer; and Romola de Pulszky, whom he met on a ship bound for South America and impulsively married. The scene on the ship, with the Golden Slave insinuating himself into their gorgeous pas de deux to Rimsky-Korsakov’s lush symphonic music, is a highlight. As is usual in ballet, the casts change; those I saw dance the leading roles are performing again on Saturday afternoon. Nijinsky moved classical ballet down the path to modern choreography, and all the Canadian dancers are wonderfully adept and compelling. I won’t soon forget Nijinsky’s anguished duets with Diaghilev, or every move by the Golden Slave (Kota Sato), or Petrushka (Evan McKie), shattered by war, or the dance of the Chosen Virgin (Jordana Daumac) in Le Sacre du Printemps. In fact, I would have preferred to see less of Nijinsky’s wearying descent into madness, to most of Shostakovich’s ultimately draining Symphony No. 11, and more of the riotous premiere of Le Sacre du Printemps, in Paris in 1913. The Rite of Spring is Nijinsky’s most famous ballet, and the events of opening night are legendary: The scene of human sacrifice, the avant-garde choreography, and Stravinsky’s then-jarring music led shocked audience members to whistle and jeer. They were so loud, the dancers could not hear the orchestra, and Nijinsky stood on a chair just offstage, shouting out the counts. In “Nijinsky,” we see and hear him calling out from the chair, but the dancers are performing to Shostakovich, not Stravinsky. After a while, you may just give yourself over to the dreamlike quality of the piece and savor the dancers’ skill, especially in the emotional moments. After the final duet, when Romola pulls her broken husband into his sad future on a sled, you may feel you’ve had an evening of more than mere entertainment. Friday, April 6, at 8:00 PM: Vaslav Nijinsky: Guillaume Côté, Romola Nijinsky: Xiao Nan Yu, and Serge Diaghilev: Evan McKie. Saturday, April 7, at 2:00 PM: Vaslav Nijinsky: Skylar Campbell, Romola Nijinsky: Sonia Rodriguez, and Serge Diaghilev: Piotr Stanczyk. Saturday, April 7, at 8:00 PM: Vaslav Nijinsky: Francesco Gabriele Frola, Romola Nijinsky: Svetlana Lunkina, and Serge Diaghilev: Piotr Stanczyk. Sunday, April 8, at 2:00 PM: Vaslav Nijinsky: Guillaume Côté, Romola Nijinsky: Heather Ogden, and Serge Diaghilev: Ben Rudisin. 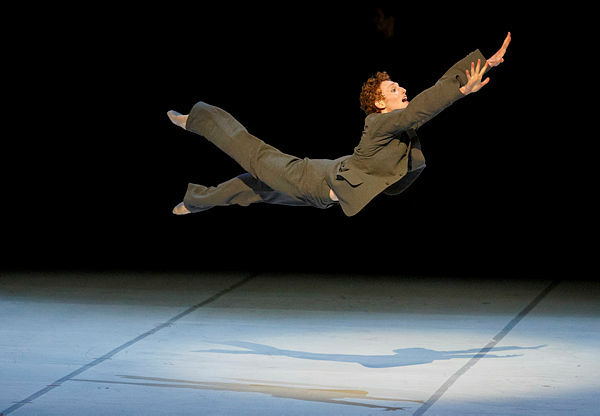 Banner Photo: Skylar Campbell (Nijinsky) and The National Ballet of Canada.